A plain white tee is very classy. If you are like me, you will wear those tops all the time when you’re heading out to the shops or just running errands, but what happens when you get horrific pit stains on them? You will feel uncomfortable and even embarrassed if you accidentally raise your hands up. And not only this, when you come home, trying to scrub them out with warm soapy water doesn’t work. Whatever detergent you use, there are still some lighter spots on the clothes. 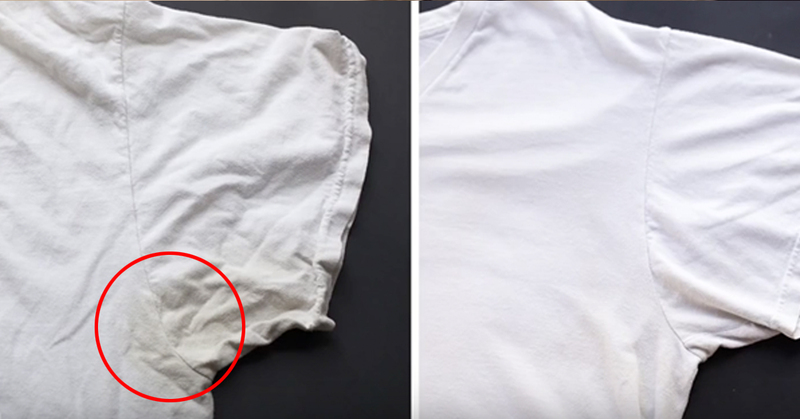 Luckily, we’ve just discovered a super easy cleaning hack that can Remove Sweat Stains From Shirt completely. This life hack is very simple. You can use things that you probably already have in your home. All you need to do is mix baking soda and peroxide together to make a miracle cleaning solution. Then the detergent is ready. Use a spoon to help you apply the paste on the sweat stains on your clothes. You can also use your fingers to spread the paste all over the stains, so it is absorbed in the shirt. Then put it in a washing machine and just wash it with the rest of your clothes. Then you take it out of the washing machine and be amazed by how clean it is. Watch our video and save yourself from tossing out your favorite shirt.